It is often assumed that the undergraduate major in sociology is designed to be the first step toward a PhD in the field. Yet, data from the second wave of ASA’s What Can I Do with a Bachelor’s Degree in Sociology?, conducted 18 months after the class of 2005 graduated, found that 60 percent of this cohort (N=778) was in the labor market and not attending graduate school. However, 30 percent were in graduate school or combining graduate school with labor force activities. Those with a bachelor’s degree who were now enrolled in graduate school were enrolled in a wide array of fields from psychology to engineering, with sociology as the predominant choice. Although nearly a quarter of graduate students were enrolled in sociology programs, less than one-third of these sociology graduate students were seeking doctoral degrees. Thus only seven percent of these graduate students were explicitly pursuing a sociology PhD a year and a half after graduating with a bachelor’s degree in sociology. 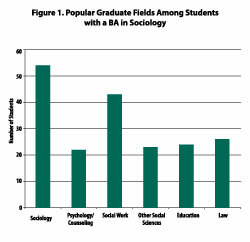 After sociology, social work and law programs were the next most popular fields among graduate students in this cohort. Nearly all of social work students were pursuing master’s degrees and all law students were pursuing professional degrees. Education, psychology/counseling, and "other" social science fields complete the list of the six most popular graduate fields, each with about 10 percent of the graduate student population (see Figure 1). 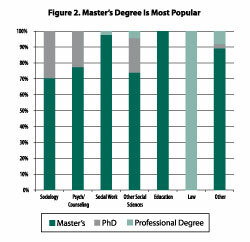 Following the pattern of sociology graduate students, the majority of psychology or other social science graduate students surveyed were pursuing a master’s degree (see Figure 2). One possible reason for the low percentage of PhD students in all fields is the timing of the survey. Many students in PhD programs may have been working towards a master’s degree this early in their graduate program, and this status may have affected how respondents answered the question of the degree that they were pursuing. Sociology graduates who responded that they were pursuing a master’s degree were more likely to also be employed compared to PhD and other professional degree students. Two-thirds of MA sociology students were both employed and enrolled in graduate school compared to only 38 percent of students completing other degrees. As shown in our research brief What Are They Doing With a Bachelor’s in Sociology?, respondents who were working full time were most likely to be employed in social service occupations that they perceived to be closely related to their undergraduate sociology major (see www.asanet.org/galleries/Research/ASAResearchBrief_revised.pdf). Graduate students in the labor force are also likely to be employed in positions related to their graduate program field. Forty percent of sociology graduate students are employed as social science researchers, 62 percent of education graduate students are teachers, and 63 percent of those in psychology programs are in social service occupations. These initial findings suggest that an undergraduate degree in sociology is the first step on an education path that produces teachers, lawyers, social workers, psychologists, as well as sociologists at the MA and PhD levels. A forthcoming research brief will further examine pathways to graduate school and graduate school experiences.